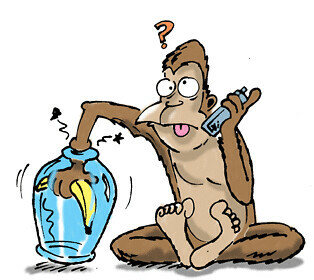 One method of capturing monkeys is to place a piece of fruit in a cage or a vessel with an opening just large enough for the monkey to put its hand through it, but small enough that if the monkey makes a fist, holding on to the fruit, it cannot take its hand out. That’s quite a lesson in letting go! Sometimes, you can achieve your goals -or freedom!- if you just let go. Do you have a monkey trap story of your own? Care to share?